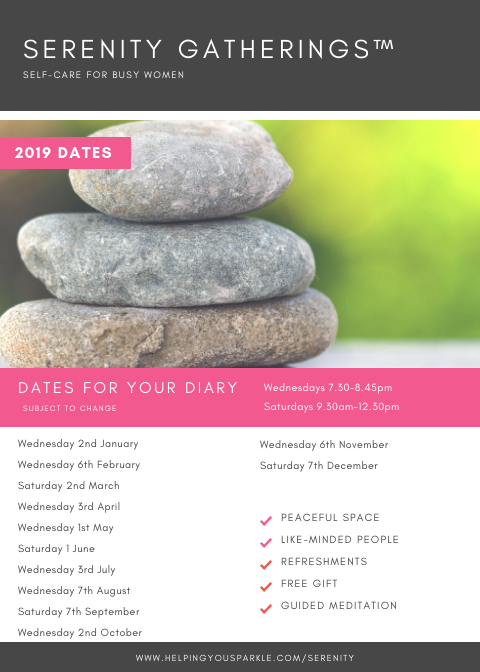 I provide a safe space at a peaceful location in Milton Keynes, for women to come together for well deserved “me-time”. I call these planned events The Serenity Gatherings™, sometimes just known as Serenity. Serenity has helped me to focus, find ‘myself’, go deep within, listen to my inner wisdom and ignore the outer chatter. I look forward to a space to ‘be’ and sparkle more in between times. During the gatherings, we talk about topics women understand and use mindfulness meditation as a way to rest and relax. We then finish the event with a cup of tea and a slice of cake. All ladies receive a free gift for attending, and are given access to a dedicated private Facebook group. Evening gatherings are around 90 minutes, ‘retreats’ are usually three hours. No previous experience of mindfulness or meditation is required. Why not subscribe to receive the latest news on forthcoming events, as well as receive Monday Mojo™, feel-good motivation for the week ahead. Sign up here. I also have a website dedicated to Women’s Wisdom, containing quotes and insights on topics women understand, called Women In Serenity™. Find out more here. There is also a dedicated Facebook and Twitter page.